The ‘Get Out’ writer-director splices sociopolitical satire with clever, full-blooded chills. “We’re Americans.” That phrase, delivered in a deathless, deadpan drawl, echoes through the twists and turns of a movie whose very title slyly evokes the common abbreviation for United States. Having taken a scalpel to the covert racism of gliberal America in Get Out, writer-director Jordan Peele turns his gaze inward for this rip-roaring follow-up, which is fearsomely entertaining, consistently thought-provoking and occasionally bloody scary. A Twilight Zone mashup of Fyodor Dostoyevsky’s The Double (1846) and Jack Finney’s The Body Snatchers (1995), spiced up once again by a wit reminiscent of vintage Ira Levin, it’s a modern fable that locates our anxieties about outsiders in a guilty fear of ourselves. The result plays like a mirror-image riposte to the 2006 French-Romanian home-invasion horror Ils (Them), suggesting that, contrary to Sartre, hell is not other people; it is us. “There are thousands of miles of tunnels beneath the continental US,” declares the film’s ominous opening statement. “Many have no known purpose at all.” This sets the unsettling scene for a 1986 prologue in which a young girl in a Thriller T-shirt wanders away from her parents at a Santa Cruz beach fairground. Entering the Vision Quest hall of mirrors, the child sees something terrifying and traumatising – or is it just her own reflection? Thirtysomething years later, the adult Adelaide Wilson (Lupita Nyong’o) returns to that same beach with her family: goofy husband Gabe (Winston Duke), argumentative teen daughter Zora (Shahadi Wright Joseph), and anxious son Jason (Evan Alex), who hides his face behind a monster mask. There are enjoyable arguments to be had regarding what Us is really “about”. Is it a classic return-of-the-repressed tale in the manner of Jekyll and Hyde (everyone has a shadow, a dark side) or a broader parable about affluent society’s parasitical relationship with a hidden underclass, like Wes Craven’s underrated The People Under the Stairs (1991)? 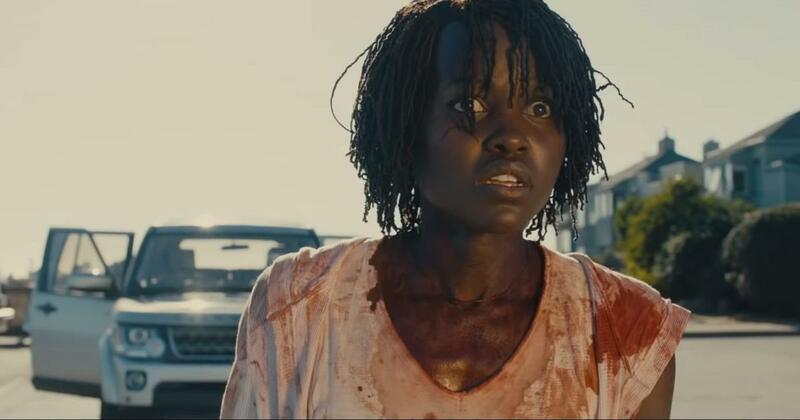 Crucially, Peele allows his audience to play it both ways – to decide for themselves what’s so scary about these subterranean visions and the spectres they bring forth. Slipping nimbly between the registers of domestic sitcom and sociopolitical shocker, Us takes time to establish its family dynamics before throwing the Wilsons (and us, the audience) to the wolves. It’s time well spent, ensuring a deep emotional investment in the characters that keeps us tethered to them even as the narrative descends into madness. Throughout, the attention to small details gives the bigger picture clout – the bickering dinner-table conversations that concisely establish each character’s strengths and weakness; the throwaway comments that cleverly set up a late-in-the-day revelation; the mimicked human gestures that creepily recall the satire of George Romero’s Dawn of the Dead (1978).